We kick off January 2017 in the Roanoke Valley in Virginia’s Blue Ridge with all kinds of exciting events! With a variety of great concerts and theater performances, as well as live sporting events, you can keep the entire family entertained during your winter getaway to the Blue Ridge Mountains. Here are 20 events happening this month in Virginia’s Blue Ridge to add to your calendar. Put on your cowboy boots and practice your “Yeehaw!” as the rodeo makes its way to the Salem Civic Center in Virginia’s Blue Ridge. 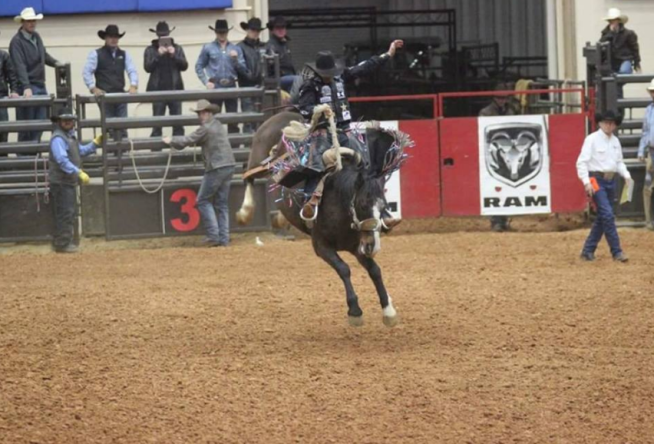 It’s three days of bull riding, barrel racing, steer wrestling, and more action full of family fun. Enjoy a night of wine and mystery at the Peaks of Otter Winery. Participants will be tasked with solving a crime while receiving clues and questions that will help lead you along the way. Was it the butler with the candlestick in the library? You’ll find out! Is decorating and remodeling on your to-do list for 2017? Get all kinds of inspiration and tips at the Greater Roanoke Home & Garden Show at Berglund Center. Whether you need help with existing ideas or want something new, you’ll leave feeling ready to tackle all your home & garden projects. All your favorite trucks will be in action at this monster truck event at the Salem Civic Center, including Equalizer, Damage, Hurricane Force, Illuminator, and Defender. VIP tickets are available so you can feel the power of these impressive trucks. Don’t miss the host of The Bobby Bones Show in his one-man comedy show. A huge star in country radio, Bobby Bones brings together his love of country music and unique humor while also sharing stories of his journey of going from a rural town in Arkansas to one of the biggest names in radio. Be transported to a jungle with Cirque Dreams Jungle Fantasy at Berglund Center. The incredible acrobatic and contortionist displays will create a magical evening where the jungle comes to life in a spectacular way. Bluegrass takes over the Harvester Performance Center on January 20 with the Lonesome River Band in concert. As one of the most iconic acts in bluegrass music, the Lonesome River Band has won multiple awards and produced 17 albums. Rick Springfield and Richard Marx join together for what will be an unforgettable night of music at Berglund Center. Both artists will play full solo acoustic sets, which will include many of their chart-topping hits. If you’re not at the Berglund Center Performing Arts Theatre for the Rick Springfield & Richard Marx concert, head to the Berglund Center Coliseum for the annual Guns N/ Hoses Hockey Game. This charity event features teams from the local police and fire departments squaring off against each other in what has become one of the region’s most popular events. Don’t wait to reserve your tickets as this game has sold out for three consecutive years. Whether you’re tying the knot in 2017 or it’s something that could be part of your future plans, the Greater Virginia Bridal Show is a great opportunity to meet local vendors and get all kinds of ideas and information to help you plan your wedding day. Listen to the soulful sounds of Davina & The Vagabonds in what promises to be an amazing night of music and creativity at The Spot on Kirk. This jazz-blues band will take you on a musical journey with their musicianship and New Orleans-style sound. It’s bluegrass and Americana at its finest when the Grammy-nominated Infamous Stringdusters come to Virginia’s Blue Ridge to perform at the Harvester Performance Center. The show will likely feature many songs from the band’s new album, Laws of Gravity, which is released on January 13. The circus returns to Virginia’s Blue Ridge with the 59th Annual Kazim Shrine Circus at the Salem Civic Center. The show will include magic, performers, and all kinds of great entertainment. Inspired by musical influences and sounds from around the world, the Yosvany Terry Afro-Cuban Sextet is a unique blend of jazz and contemporary. Terry is a Grammy Award-nominee, as well as a recipient of the prestigious Doris Duke Artist award. The Velocity Tour visits Virginia’s Blue Ridge for the first time with this two-night show at Berglund Center. See professional bull riders take on some of the best bovine athletes in this adrenaline-filled event. Experience the Harlem Renaissance through “Raisin’ Cane”- a production based on Jean Toomer’s 1923 novel. The story focuses on the emergence of artistic expression in the African American community following World War I in 1918 and offers a window into this vibrant part of American history. Hollins University will perform two shows of “Marvelous Cornelius” at Mill Mountain Theatre’s Trinkle Stage on January 28. The story is based on Phil Bidner’s children’s book, which is centered around Cornelius, a New Orleans sanitation worker whose bright spirit was an inspiration in the aftermath of Hurricane Katrina. Indulge in an afternoon of wine at the Taubman Museum of Art’s International Wine Festival. The event will feature over 30 wines from around the world and attendees can partake in food & wine pairings, in addition to receiving guidance from wine experts. There are plenty of chances to see the Roanoke Rail Yard Dawgs in action this month as the Dawgs take the ice for six home games. It’s always an affordable, fun night out for family and friends! Lace up the skates and spend a Blue Ridge Day on the ice at ROA’s Elmwood on Ice in Downtown Roanoke. From a romantic date to an afternoon with the kids, ice skating in the park is the perfect winter scene. Visit our Calendar of Events for a complete list of things happening in Virginia’s Blue Ridge. You can also get additional ideas for your next vacation by subscribing to our e-newsletter and following us at @visitvbr on social media. Don’t forget to also tag your posts with #BlueRidgeDay!